Near the small desert town of Santa Ynez, a mysterious black car runs down two teenage bicyclers en route to camp, then it hit-and-runs a hitchhiker with local Amos Clements as witness. Sheriff Everett puts his men on alert and plants road blocks in the area to arrest the murderer, but soon he himself falls victim to the car. Sheriff Wade Parent leads the hunt for the vehicle that threatens their town and seems impossible to locate. When his beloved girlfriend, teacher Lauren Humphries, challenges the driver in a cemetery, the car hunts her in her home. Wade realizes he might be dealing with supernatural powers. A mysterious black, sleek automobile terrorizes everyone it comes into contact with in a small town in Utah. The local sheriff may be the only person who can stop this menace which has been possessed by pure evil. 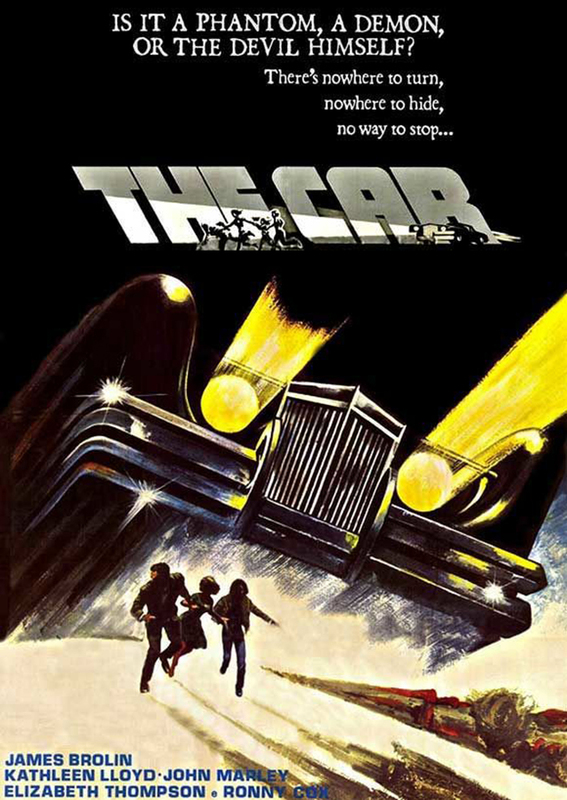 "The Car" wouldn't be the first suspense movie with a haunted, or predatory car, or whatever. No doubt influenced by Dennis Weaver's "Duel" (1971), and most likely a direct influence on movies "Christine" (1983) and Charlie Sheen's "The Wraith" (1986), and "Maximum Overdrive" (1986). It even manages to lift its ending from both "Duel", and "Five Million Years to Earth" (1967), and scenes were copied in both "Christine" and "The Wraith". An indestructible car, for some reason, shows up in a small desert city and starts killing people, its first victims being a young, and future, soap star Melody Thomas Scott, and an equally young hitchhiker John Rubenstein, who would later be known for his heavies. The deaths and the mayhem continues throughout the movie as people continue to be knocked off and the assistant sheriff continues to unravel, especially after his mentor, the sheriff, is killed. There is the requisite melodrama, the abusive drunk and his abused wife, the young single sheriff's two rambunctious children and his love interest, the hot school marm. There are no surprises to be found anywhere in this flick, it's just a fun "B" movie with an experienced cast doing the best they can with their material and for a paycheck. The cast includes such TV stalwarts as James Brolin, as the young sheriff; Kathleen Lloyd (Magnum PI) as the school teacher and love interest; Kim Richards (Escape to Witch Mountain, Tuff Turf) and her sister Kyle Richards (Halloween), both of whom would end up being reality stars; R. G. Armstrong as the mean drunk who would redeem himself somewhat; John Marley (The Godfather) who spent his long and illustrious career as both a heavy and a Mafioso here plays an-out-of-character good guy; Ronny Cox as a young assistant sheriff who's a drunk on the side; and soon-to-be professional stunt woman Leslie Hoffman. And let's not forget the writer/director Michael Butler who was also one of the co-writers of the unofficial Dirty Harry move "The Gauntlet" and the unofficial "Shane" remake "The Pale Rider'. Not a great movie by any means, but certainly fun if you're not expecting much and you just want some fun entertainment. Taking a leaflet out of Steven Spielberg's Duel, The Car creates its own aura of suspense & terror, and is a smartly crafted & skilfully executed horror that makes excellent use of genre elements to retain its tense vibe and, despite a few hiccups, manages to be consistently gripping from start to finish. Set in a small deserted town, The Car concerns a mysterious black car that surfaces in the town one day and goes on a killing spree, terrorising anyone & everyone it happens to come in contact with. The plot mainly focuses on a local sheriff who tries to stop this menace before more people fall victim to it. Directed by Elliot Silverstein, The Car establishes its evil intentions within the opening scene and only takes it up from there. The director is able to encapsulate the tale with an ominous ambiance and the way he utilises the car throughout the movie only adds a diabolical feel to it, which in turn amplifies the film's sinister tone. Sure the characters aren't well-sketched and dialogue is even worse, the performances, however, still manage to be passable, especially from James Brolin & John Marley, both of whom play their roles with flair. The titular machinery is a menacing character in itself and the slight modifications provided to it only add to its mystery. On an overall scale, The Car makes efficient use of its limited budget to bring its foreboding tale to life and is quite effective for the most part. There are times when it enters the unintentionally funny zone but its firm grip on viewers' attention & apt application of the element of suspense makes it a cinematic ride that's thrilling enough to be worthy of your time. The demonic car in this film was designed by George Barris, who specialized in custom cars and who worked on a number of film and television projects, including the car driven by TV's "The Munsters", Herbie "The Love Bug", and the vehicle driven by the heroes in "Ghostbusters". For "The Car", Barris modified a 1971 Lincoln Continental Mark III.